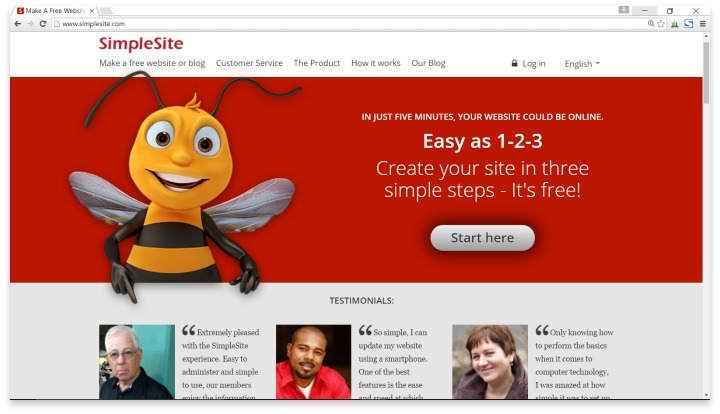 Founded in 2003, SimpleSite is a different take on the template-based website building platform. Rather than offer their users a bevy of templates to choose from and then customize, SimpleSite makes it even easier for those who don’t have the time or know-how to build a website. Instead, users choose what “type” of website they are building, from SimpleSite’s list of types (which could be thought of as templates), and then an interactive design wizard walks you through the set up of your website. As SimpleSite says, this isn’t geared for professional developers or large businesses. This is for one-man shops or personal websites, people who need simple, fast, and good. They offer free trials, and then affordable packages after that. For what it is, SimpleSite works well. If you don’t need to learn anything about website set up, and you just want something that works the first time, it’s a great tool. For everyone else, the bad outweighs the good. For one thing, SimpleSite’s editor and customization options are decades behind competitors. There are very few modifications that you can make on their “types”, which are all molded on the same basic design. The extra features that you’re used to seeing from big name website developers just don’t exist here. However, SimpleSite’s simplicity does work in its favor when it concerns mobile responsiveness. Your website with SimpleSite will look just fine on mobile devices without any loss of content. It takes very little time to set all of this up, so it may be a great service to use when you’re still shopping around for the perfect website host for you. A major downside is the misleading information on SimpleSite’s free version. There is a free trial, but pains are taken to hide the fact that this ends after 30 days. If you choose not to subscribe to one of their somewhat expensive monthly plans, your website will be entirely deleted, with no way for you to get the information that was on the website. Additionally, if you ever miss your renewal date, your website is likewise deleted, so having your own backups is a must. The only way to contact SimpleSite for customer service is via email, and they list their return time as about two days, which doesn’t work for small business owners when your site is down. Two days could cost you thousands in sales. Speaking of sales, SimpleSite does include e-commerce tools that are available at every subscription level, and they come already optimized for SEO capitalization. While they do offer a generous number of 40 pages with any website, most of the types of websites that will be best for SimpleSite’s set up are hardly going to need that many pages. SimpleSite provides customers who need simple, fast, and good websites. They offer free trials, and then affordable packages after that. If you want a basic personal website, or just a place where your freelance services can be advertised, and you don’t want to waste any time learning the ins and outs of a website building tool, SimpleSite can be perfect for you. For most users, though, this service is too outdated and not feature-rich enough to do much for you. In fact, even for single users who want their service to be totally easy, there are much better options out there with just as intuitive building tools that will result in a stylish website more likely to drive traffic to your business. Have you had an experience with this company? Please share your SimpleSite Reviews below.